One of two otters we watched along the Río Piloña. Yesterday was another gloomy Saturday. The river was high and the water murky with a strong, fast current. Add to the mix constant rain – and not ideal conditions for a walk. But we went out anyway. 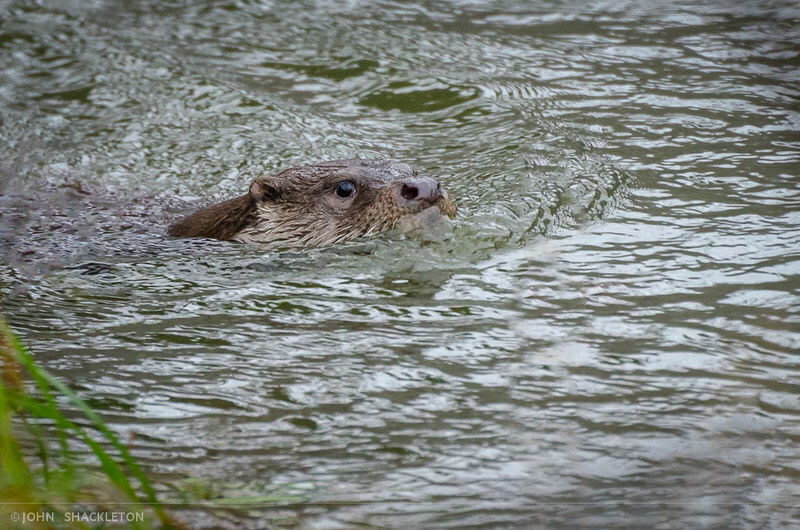 As luck would have it, after just 20 minutes, we spotted two otters – both were swimming impressively fast along the Río Piloña. Once again, they proved to be capable of swimming faster than we can run! During the chase to get ahead of them, we got soaked trying to jump lake-sized puddles and scrambling down a muddy riverbank. Be did a great job with the umbrella, protecting me and the camera from the rain, whilst scanning the river with her binoculars. In the end, 28 of the 29 shots we took were either blurry, partial shots of an otter’s tail or empty river water. One shot was perfect. The image above was taken at f5.6, 1/400, ISO1600 at 280mm with a Nikon D7000, Nikon 70-300mm lens. It was raining during the entire encounter and with the inevitable poor light, I’m happy the image is so clear. I think this picture has become a new favourite – especially accompanied with memories of watching an otter pass by, just 3 metres away, and completely unaware of us. I’m unable to see the image, John. I don’t know why. I’d certainly like to, though! I don’t think I could get closer…. Best wishes, John.